When you want to spruce up your kitchen but don’t want to spend a little money, add a bit of color. 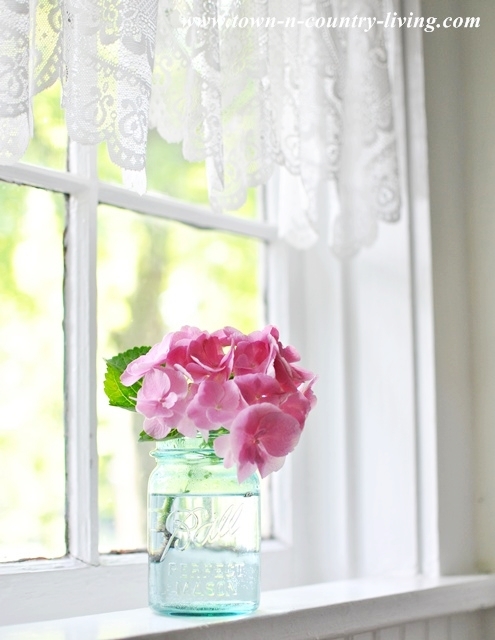 It’s easy to do and really freshens up the heart of your home. My kitchen is mostly white which makes it easy to add any color. What’s great about adding color to the kitchen is that you probably already have things on hand that will do the trick. Here are some easy ideas to add a bit of kitchen color. 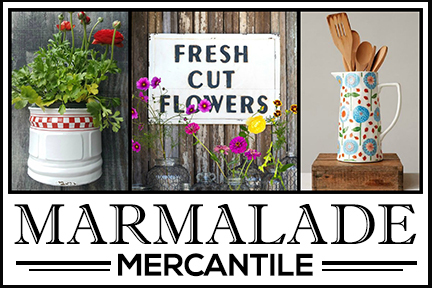 You can find farmhouse signs at the flea market, on Etsy or eBay, at thrift stores and local boutiques. My milk and cream sign adds just the right touch of red and aqua. 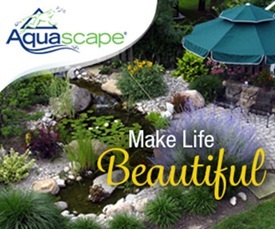 The easiest way to add color during the spring and summer months is with natural elements. Flowers from the garden or even a bowl full of lemons or apples add a quick and inexpensive pop of color in the kitchen. 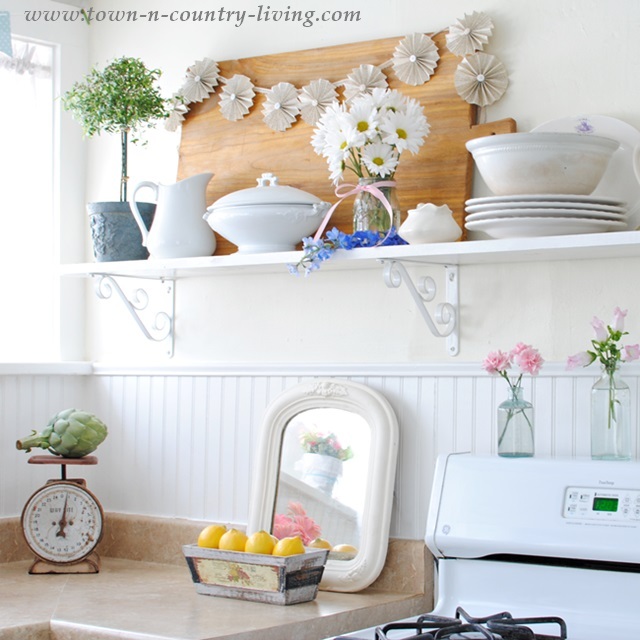 Flowers on the windowsill are perfect for farmhouse and cottage kitchens, but there’s no reason why you can’t follow this same concept for traditional, modern, or more formal kitchens. If you’re not comfortable with a lot of kitchen color, add it temporarily by setting a festive table. On this spring tablescape in my breakfast nook, I used folded, colorful kitchen towels as a table runner. Wheat grass and apples add a bit of red and green. 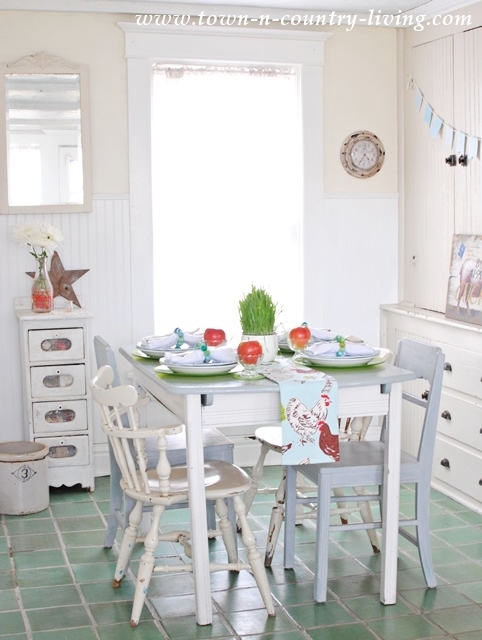 In this year’s spring home tour, I added yellow and aqua to the kitchen table. Pick two of your favorite colors and add them with flowers, canisters, bowls, and dishes. 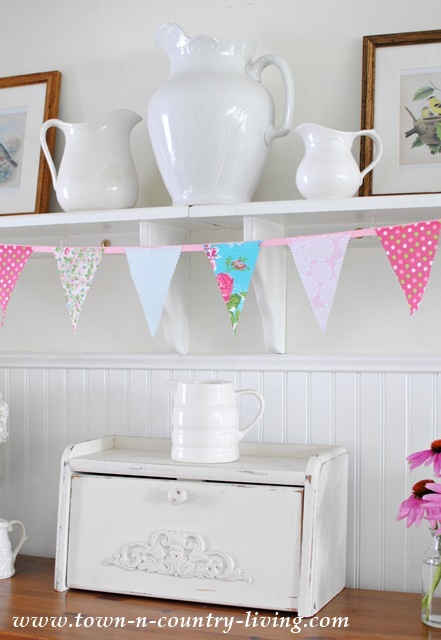 This no-sew banner is a fun way to add color to the kitchen. Make one in just minutes. You can even make several in seasonal colors and swap it out according to the time of year. 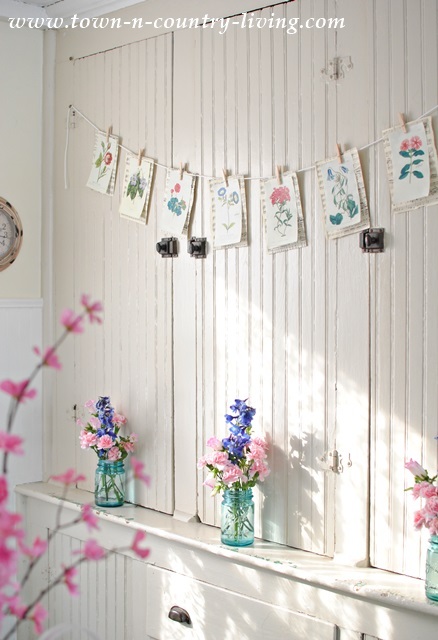 This easy botanical banner is still one of my favorites that I hung in the kitchen. Light fixtures are a unique way to add color overhead. 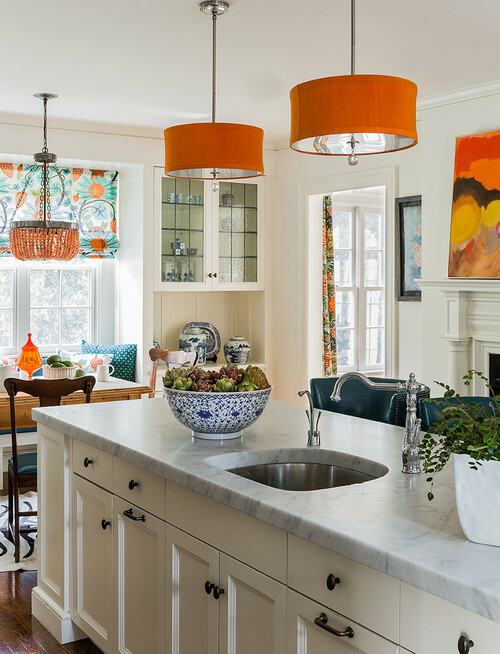 Orange pendant lights are balanced by the cool blue hues in this pretty kitchen. 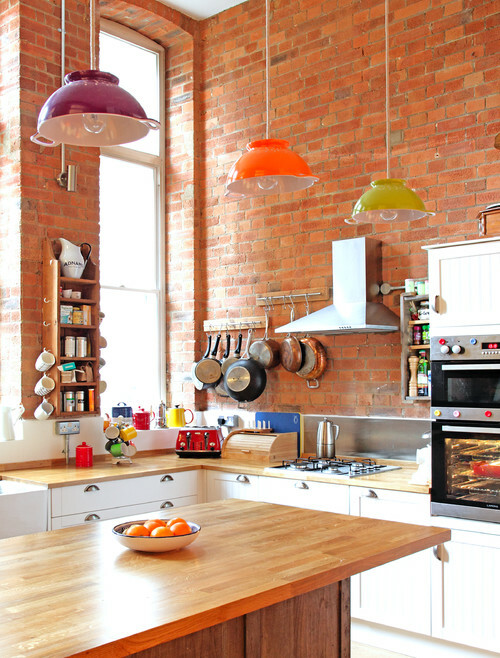 Are you brave enough to hang three different colored pendant lights? This idea takes a little more work if you do it yourself, but paint doesn’t cost a lot of money. 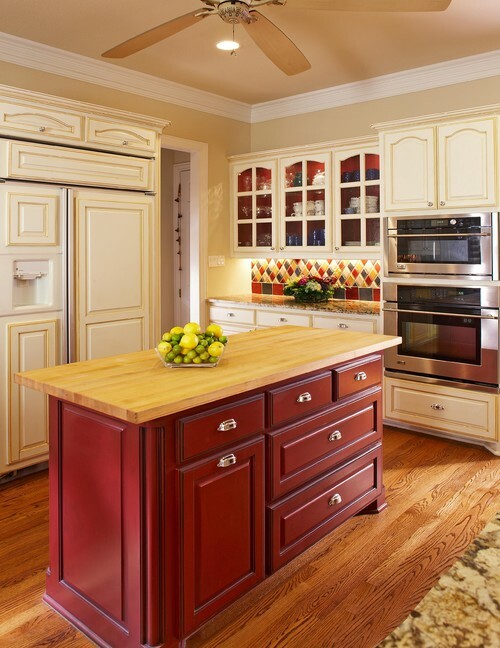 So it’s still a fairly economical way to get a new look in your kitchen with color. 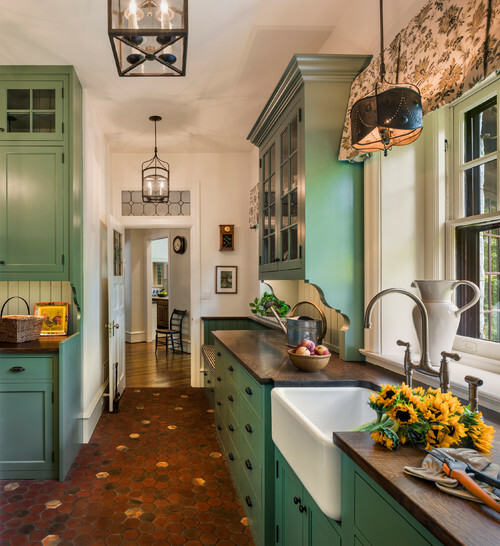 If you don’t have the gumption to paint all your kitchen cabinets, consider painting just the upper or lower cabinets in a coordinating color. 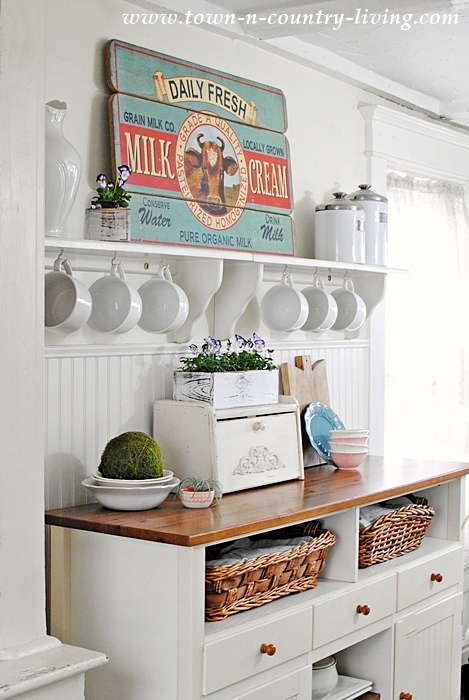 Or just paint the kitchen island a fun color. What other ways have you added a bit of kitchen color? 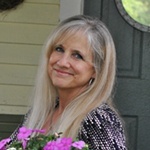 I really enjoy your blog and love your decorating tips! Could I ask where you purchased your pretty sign? I love turquoise and this sign is so pretty! I always look for the latest placement of your mirrors. And what dishes you’re using. 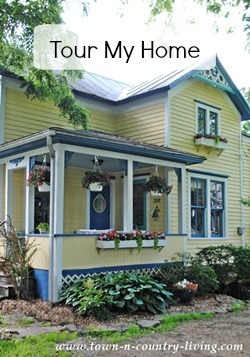 As always, your house looks so cozy and inviting.